Never talked about except in elite circles, do you have a scapula protracted catch? What about recovery? 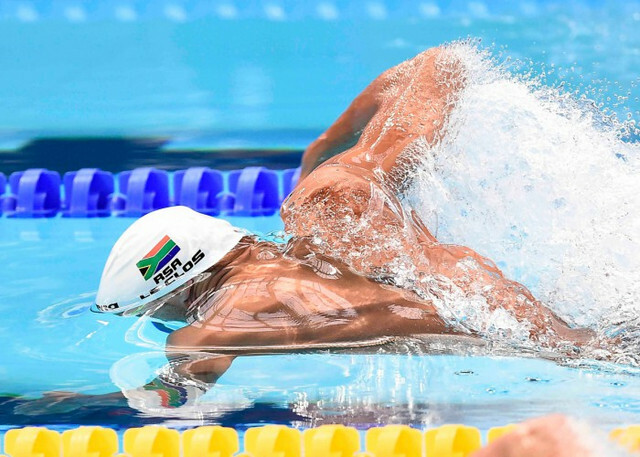 do you pull your scapulas together like Le Clos? Has your coach ever even broached the subject of scapula protraction & retraction during the stroke cycle? The shoulder is the most important joint complex in swimming, as it performs around ~16,000 revolutions per workout and is the main contributor in force production. Unfortunately, many flaws exist at the shoulder. One common flaw, which prevents force production during the swimming catch and push phase is the use of a scapular protracted swimming catch. Some may feel identifying this flaw is picky, but force production is crucial for elite performance. Determining if a swimmer uses a protracted swimming catch is first recognized can first be recognized underwater, characterized by an extremely deep swimming catch, wobbly hand during the swimming catch, and/or poor water grab during the catch. Above water, one may note a scapular protracted catch, if the swimmers is reaching extremely far during the entry (attempting to increase distance per stroke), but doesn’t propel themselves underwater (due to impaired force production. Impaired force production is a likely result of instability. If the scapula is held in protraction during the swimming catch, then it doesn’t have a stable base for propelling the body forward. The reason this happens is because the shoulder is the foundation of the arm. If the foundation is unstable or weak (like it is during protraction), then the arm because wobbly and weak, both problems for force production. If it is determined a swimmer has a protracted swimming catch and push phase during freestyle, it is necessary to determine if they do this because they don’t have the out-of-water tools to implement this movement. To test this, identifying any muscle length discrepancies is paramount. The scapula is moved posteriorly and medially along a transverse plane, moving the arm and shoulder joint posteriorly. Retracting both shoulder blades gives a sensation of “squeezing the shoulder blades together”. This movement commonly occurs during a rowing movement and should occur in the swimming catch phase of swimming. Protraction is the opposite of scapular retraction. The scapula is moved anteriorly and laterally along the back, moving the arm and shoulder joint anteriorly. If both shoulder blades are protracted, the scapulae are separated and the pectoralis major muscles (in the front of the chest) are squeezed together. Protraction occurs if an athlete reaches forward during the entry phase of freestyle. Internal rotation of the arm is most easily observed when the elbow and shoulder are held at a 90-degree angle of flexion. Internal rotation occurs when the arm is rotated at the shoulder so that the fingers change from pointing straight forward to pointing towards (perpendicular) the ground. This motion occurs during the swimming catch phase of freestyle while the swimmer achieves an early vertical swimming catch. If a swimmer has their scapula protracted catch with limited internal rotation on land, but enough protraction and retraction, then the swimmer may be performing this stroke deviation as a compensation for the lack of shoulder internal rotation. If a swimmer has adequate internal rotation and protraction, but not enough scapular retraction, the athlete may not have the strength or timing to perform retraction during the swimming catch. These are only two possibilities, as assessing length is just one part of the troubleshooting system. Strength and timing must also be assessed, in combination of motor control (biomechanics) pool training. Troubleshooting is difficult, but the most effective method for solving the puzzle of flawed biomechanics, the largest factor for swimming success! I think this could be responsible for alot of the problems obtaining evf? ie trying to get Evf with a protracted shoulder blade at full extention? i think there needs to be some sort of scapula retraction that goes along with the forearm pitching down? Hand paddles would really exacerbate it too? Shinji and coach Shen often talk about relaxing the shoulder of the catching arm as the reovering arm comes level with the head, i can see now that this would allow the scapula of the catching arm to begin retraction as it locks on and anchors in the water, so fully connected to the core when the spearing arm enters.